Morning prayer: An 8th grade leader assists our Principal each morning in inviting the whole school community to prayer. We offer ourselves, all our thoughts, words, actions, and sufferings of the day through the Morning Offering and daily prayers of devotion and praise. Afternoon prayer: Each afternoon, the students end their day by praying the Angelus (or Regina Caeli in Eastertide), recalling that sublime moment when the Angel announced the coming of our salvation in the conception of Christ in the womb of Mary. An examination of conscience and Act of Contrition allows the children call to mind the hurtful thoughts, words, and actions of the day and to ask forgiveness for them to start the next day fresh and new. Weekly Mass: Each Wednesday morning, we gather as a school community in the beautiful Church of St. Michael for the summit of all prayer: the Holy Sacrifice of the Mass. From the choir, to the readers, gifts bearers, and servers, our students are engaged in the liturgy and lead the adults present to greater worship and reverence of the God who comes to meet us in Holy Communion. Sacrament of Reconciliation: Our students have an opportunity to receive the Sacrament of Reconciliation several times each year. They are prepared in the classroom to receive the sacrament and time is given in the course of the school day for this sacrament of healing. 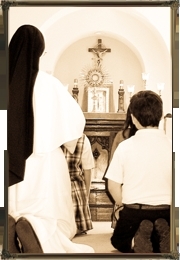 Retreats: Students preparing to receive their First Holy Communion are given the opportunity to make a full day retreat prior to First Communion. Our Middle School students make retreats annually to prepare them for the tasks ahead in the following grade level. Our 8th graders are given a special Leadership retreat at the beginning of their 8th grade year forging life-long friendships with each other and with the Lord. Our annual Faith Rally at the conclusion of Catholic Schools Week is a school-wide retreat inviting parents to participate in the life of faith fostered at the school.